The Silicon Valley and the Garden City of India, Bangalore (now Bengaluru) doesn’t need any introduction at all. Whether you are visiting Bangalore for fun or vacation or business, staying in a hotel in the right area plays a key role to a successful trip. This travel guide shows you the major landmarks in Bangalore and helps you choose a nice accommodation accordingly. MG Road is one of the most popular landmarks and busiest areas in Bangalore. It starts from Trinity Circle, runs towards the east, and ends at Anil Kumble Circle. Major government and private offices, buildings, shopping malls, theaters and restaurants are located on MD Road. Bangalore International Airport is 35 km from here. MG Road is 10 km from Yeshwantpur Railway Station, 6 km from Bangalore Main Railway Station and 5 km from Majestic Bus Stand. If you want to have a central location during your stay in Bangalore, choosing this area for accommodation can really help. Transportation is well-equipped with BMTC bus service and the newly started metro rail (Mg Road metro railway station). One of the oldest roads in Bangalore, Residency Road is a cluster of landmarks. This area is a heaven for nightlife lovers and foodies. By staying in this location, you can have an easy access to other major areas such as Shastri Nagar, Surya Colony, Air force Area and Airport Road. Residency Road also houses office of the Consulate General of Germany. It is at a distance of 35 kms from the airport. Yeshwantpur and Bangalore Main railway stations are 12 km and 5 km respectively whereas Majestic Bus Stand is 3.5 km from here. Also known as Bangalore City Railway Station, it is located in Subhash Nagar area. By staying near it, you can have a frequent visit to any part of the city. Gandhi Nagar, Majestic Bus Terminal and Bangalore City Metro Station are a short walk from here. Several hotels in Bangalore near the main railway Station also provide complimentary railway station pickup and/or drop. Another major railway station of Bangalore, it is located on Millers Road in Vasanth Nagar. Some major landmarks nearby this station are CSI Hospital, Masjid-E-Khadria and United Technological College. Yeshwantpur Railway Station is also a major gateway of Bangalore by railways. Located some 10 km north from the city center. The famous MS Ramaiah college and hospitals is located nearby. Also known as Kempegowda Bus Station, Majestic Bus Stand is located in the prime area of Gandhi Nagar. It is simply the backbone of road transport in the city. Getting accommodation in Bangalore close to the bus stand can be extremely advantageous from location and transportation point of view. Another major advantage is that you also get a chance to cover Bangalore City railway Station on foot. 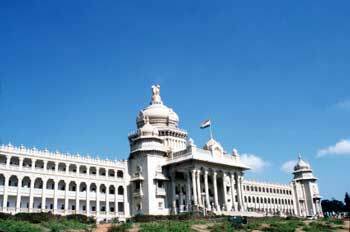 Vidhan Soudha, the legislative seat of Karnataka, is one of the prime identities of Bangalore. Located on Dr. Ambedkar Road in Seshadripuram, it is equally known for its administrative importance as well as construction style. Other major landmarks situated nearby are Karnataka High Court and Cubbon Park. To reach there by bus, get off at Vidhana Soudha bus stop. Major transport centers such as Bangalore Main railway Station (6 km) and Majestic Bus Stand (4 km). There are many good hotels in price ranges and rates around the Vidhana Soudha area. Famous as the "Lung" area of Bangalore, Cubbon Park is a renowned attraction and icon of the city. You can reach here easily from major areas such as MG Road, Hudson Circle and Ambedkar Road. Being itself a major attraction, the park also houses some other prominent attractions such as Attara Kacheri, State Archeological Museum, Queen Victoria Statue and Seshadri Iyer Memorial Hall & Library. Another major charm is the Bangalore Aquarium located at the entrance. It is just 4.5 km from Bangalore Main Railway Station and 3 km from Majestic bus terminal. By staying near Cubbon Park, you can also have an easy access to Gandhinagar (2 km) - another central area in Bangalore. Located in the southern part of Bangalore, Lalbagh Botanical Gardens is undoubtedly a gem in the crown of the Garden City and is popular both among the locals and tourists. It is just 7 km from Bangalore main railway station. Visitors to Bangalore can choose from many nice hotels located close to Lalbagh Botanical Gardens.